Hummer, the off-road vehicle that once was a symbol of America's love for hulking trucks, is now in the hands of a Chinese heavy equipment maker. General Motors Co. and Sichuan Tengzhong Heavy Industrial Machinery Corp. finally signed the much-anticipated deal to sell the brand on Friday, according to a joint statement issued by both companies.Tengzhong will get an 80 percent stake in the company, while Hong Kong investor Suolang Duoji, who indirectly owns a big stake in Tengzhong through an investment company called Sichuan Huatong Investment Holding Co., will get 20 percent. He also is the controlling shareholder and chairman of Lumena Resources Corp., a Hong Kong listed mining company. Financial terms were not disclosed, although a person briefed on the deal said the sale price was around $150 million. GM said in its bankruptcy filing last summer that the iconic brand could bring in $500 million or more. 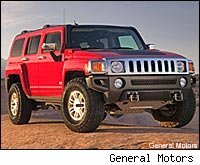 The investors also will get Hummer's nationwide dealer network. GM and Tengzhong said in a statement that the transaction still must be approved by U.S. and Chinese regulators.